This weekends stock is Sagicor Financial (LSE:SFI). I got quite interested in this stock because it appears to be trading at a stupidly low PE if looking at continuing operations. But because of a large loss making division it comes up with a PE ranging from 20 to 300 on most screeners. This means its probably gone unnoticed by the majority of investors. As soon as this loss making division is disposed of (management have stated their intention to do so) they will be on a PE ratio of just 3.5! And thrown in for good measure, it currently trades at a 38% of tangible book value excluding the equity of the loss making division (which has positive book value). And for you dividend lovers out there, it currently yields 6.9%. Surely this sounds too good to be true?!? As the majority of the business is writing life insurance, I will say now that looking at net income doesn’t really mean too much. We should be more focused on book value and its growth over time. If you read through past annual reports you will see that previous years net income gets radically restated frequently. Sagicor owns a large number of subsidiaries, but not entirely, which is why the ‘minority interests’ figures in the financial statements are significant. The business is split into the following segments (the numbers are from 2011 as that is their latest annual report available). The Sagicor Life Inc segment consists of the life insurance subsidiaries which conduct business in Barbados, Trinidad and Tobago, the Eastern and Dutch Caribbean islands, Belize, Bahamas and Panama. This segment comprises Group subsidiaries in Jamaica and Cayman Islands conducting insurance under the Sagicor brand, and banking and other financial services under the PanCaribbean Financial Services (PCFS) brand. The principal products of the segment are the provision of life, critical illness and health insurance, annuities, pension administration, investment management, securities dealing and commercial banking. This segment comprises the Sagicor at Lloyd’s business, and consists primarily of property and casualty (P&C) insurance business written through Lloyd’s of London Syndicate 1206. This segment consists of the USA operations of Sagicor which market life insurance and annuity products to individuals. No prizes for guessing which division they want to dump. It is the Sagicor Europe division, which ceased being profitable in 2010 and has racked up losses of $100m in just three years. No wonder they want to get rid of it. Insurers are all about the balance sheet and management. Life insurance is a lot more predictable than property and casualty insurance which is good for an investor but they both involve a large float of investments, the performance of which can make or break the company. But before I go through their assets, I’d first like to pick out something from the last annual report that I was pleased by. Operating in the Caribbean the insurance laws are quite relaxed, but Sagicors management has opted to follow strict guideline’s from Canada. This is a good start but it’s still necessary to go through the balance sheet. After going through it and the notes I found only minor things that were of concern but the most interest part is their investment portfolio, shown below. 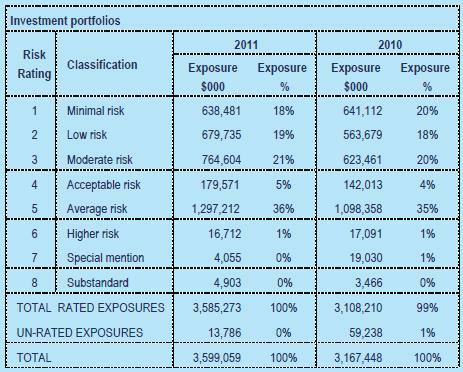 Risk rating ‘5’ is a Moodys B rating, which isn’t good. It turns out they have $1.3bn invested in bonds of Jamaica. You don’t know how saddened I was to find this table after a whole day of researching this company thinking I was onto a sure thing! Jamaican bonds yield around 8%, which is extremely high for government debt. The bonds have been restructured a couple of times in the past and with debt to GDP of 140% and continual failure to reduce their deficit, this is high risk to say the least. Sagicor is showing no signs of reducing its exposure either. In what appears to be nothing but madness, it is increasing its holding every year. This may go some way to explaining why the company did a rights issue in 2011. If all these preference shares were converted the share count would go from 304m to 364m. But the preference shares are redeemable in 2016 for US$1. So this would only make sense if the price of common shares exceeded US$2, or £1.28. This virtually puts a price ceiling on the investment up to 2016. But the good news is that at a bid price of 34p today these shares have a long way to go before we need to worry about this. As an aside its also worth noting that cumulative dividends to common shareholders (and share repurchases!) from 2011 onwards cannot exceed 50% of cumulative group net income. This is a very odd clause to put in their articles of incorporation. I think it is to stop them paying out more than the shareholders earnings in dividends, but it does signal that returning cash to shareholders isn’t top of the agenda to say the least. Here are the summary historical results of the company, separating out the continuing segment. First lets work on the premise that Jamaican bonds will not default. I think it is clear that the company is undervalued and would be worth around shareholders equity. That’s 3 times the current share price of 37.5p (58.4 cents). But in the event of even a partial haircut this companies equity will vanish and insolvency looks like a real danger. In the past Jamaica’s debt was restructured by extending the term of the bonds, but having done that twice already a haircut isn’t off the table. What really surprises me though is that the ratings agencies have given Sagicor a BBB rating (moderate risk), despite it holding $1.3bn (double its book value) in Jamaican debt which it rates as CCC+ (high risk). Finally I will say that I think it unlikely for Sagicor to reduce its holding in Jamaican debt. They obviously need some Jamaican dollar denominated assets, the only other way would be to invest in foreign bonds and hedge the currency, which would likely significantly reduce investment returns and hence the attractiveness of this investment for us. For me Sagicor is too high a risk to take, I prefer low risk investments with a protected downside, here there is a real risk of total loss. But for those less risk averse this could present an attractive risk/reward ratio. I live in Trinidad and Tobago and I am long Sagicor. I expect either a turn around or a takeover by one of the regional banks. The simplest solution to the Jamaican exposure is to sell to the 33% minority shareholder in the listed Jamaican subsidiary. They will buy in a heartbeat and finance can be provide also. See recent documents below you may not have seen. Acquisition of a large block of policies.